I’m assuming this is from Marty Scrull’s Instagram account. Chris, Jeremy & Kevin are with you this week to discuss a wide range of topics in the world of professional wrestling. They start by talking about the garbage main event Kevin is in for when Smackdown Live brings Fastlane to Columbus. What did he do to deserve both Dolph Ziggler and Baron Corbin being in the match with Kevin Owens, Sami Zayn and AJ Styles? Speaking of Styles, was he even on SD Live this week? Or his (assumed) opponent at Wrestlemania Shinsuke Nakamura? How much talent did Raw grab when the Superstar Shake Up happened? Did losing The Miz cause the biggest problem for the brand? Couldn’t John Cena appear on SD Live to help make their product better? Would you ratehr Cena face Elias or Undertaker at Wrestlemania? Do we need to say much more about how awesome Braun Strowman is? How was Jeremy’s visit to the ROH show in “Charlotte”? Why was the timing bad? 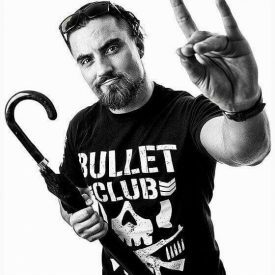 Did anyone wear anything other than Bullet Club shirts? Would it have helped his live experience to be more familiar with the current stars like Matt Taven and Jonathan Gresham? How are the Motor City Machine Guns and the Brisco Brothers doing the same thing a decade later? How to the guys get back around to talking about the WWE? Find out by clicking the link below!